Home / Unlabelled / Sony files patent for a "SmartWig"
Sony files patent for a "SmartWig"
Sony is taking wearable technology to a whole new level. Regular wigs are so passé. Sony has just filed a patent for a "SmartWig". The Japanese electronics company has filed a U.S. patent for a "SmartWig," which will use sensors to detect everything from blood pressure to brain waves. The wearable wig could also be used in a number of practical ways, such as helping blind people navigate without any extra assistance, said Sony (SNE) in its filing. It could also come in handy for the gaming industry, especially for virtual reality fans, and could be hooked up to Wi-Fi, Bluetooth and radio transceivers, according to the patent application. Wearable technology is starting to become a hot trend, with both Google (GOOG, Fortune 500) and Samsung (SSNLF) jostling for market share. Google launched Google Glass in May and Samsung unveiled its Galaxy Gear smartwatch in September. Both products have generated a lot of buzz but skeptics have been pretty vocal, questioning the cost and benefits of the devices. 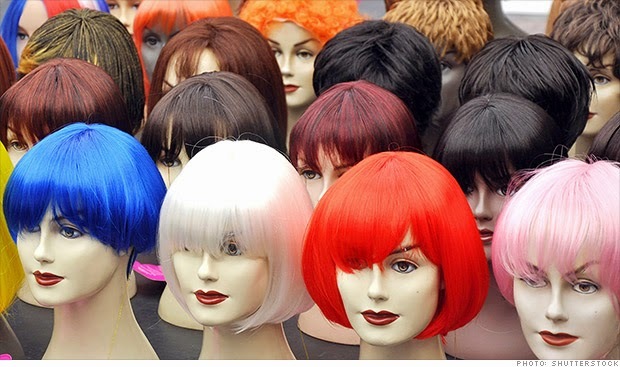 Don't expect to see the "SmartWig" on store shelves anytime soon. The technology is still in "fundamental research stage and it has not been decided whether to commercialize the technology or not," said a Sony Europe spokesperson. Sony has been trying for years to keep pace with rapid changes in the consumer electronics business, struggling to match the innovative gadgets produced by rivals such as Apple (AAPL, Fortune 500).